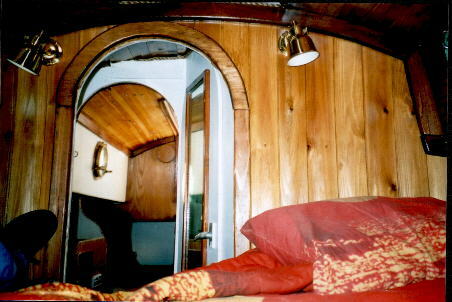 The following photos are of my current project restoring a 1970 Westerly Centaur. 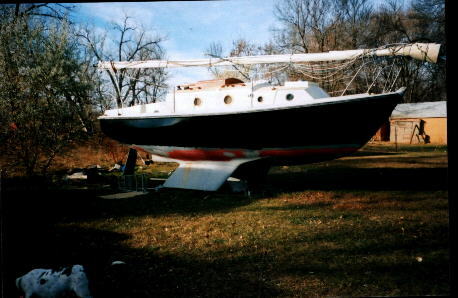 "Levara" was purchased in the spring of 2000 in Onancock, Va. and trailered to Bismarck, ND. I had spent a lot of time on a good friends Centaur and decided that I had to have one of my own. "Levara" had been launched in England in 1970 and sailed to the Mediteranien and spent the first 4 years of her life there. She was sold to an American in Malta and sailed to San Francisco, then through the Panama Canal to the Carribean and the Virgin Islands where she spent most of her years. After about 10 years in the Virgin Islands she made her way up the coast through a progression of owners from Florida to Virginia and the Chesepeake Bay. 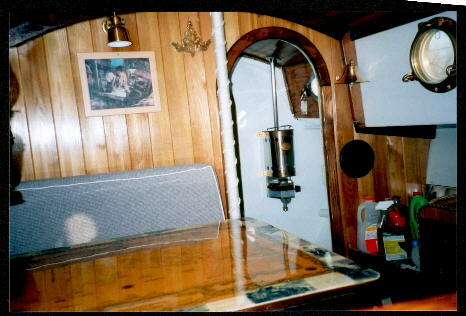 The last owner had intended to sail her to Australia but age and health concerns put an end to his plans and he sold the boat to the marina owner., from whom I purchased her. 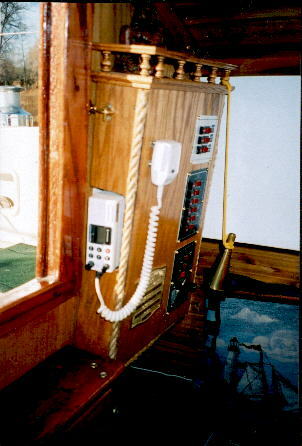 She had a fairly new diesel engine and transmission., new sails and new standing rigging. She had a lot of cosmetic problems though. Although the twin keels had been re-sealed and a barrier coat applied along with fresh bottom paint when I purchased her, the keels were so heavily rusted that they actually crackled when pressure was applied to the visible rust blisters under the fresh paint. 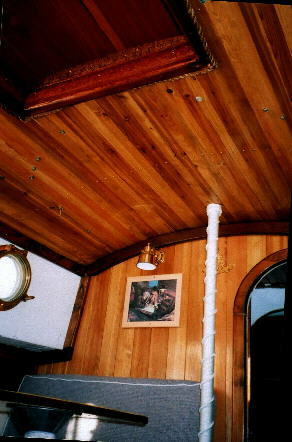 Such little surface prep was done to the bottom that large chips of paint and even sea crustations were painted over. All of the old seacocks leaked and were immediately replaced, and there was heavy salt corrosion and heavy mildew throughout the interior. 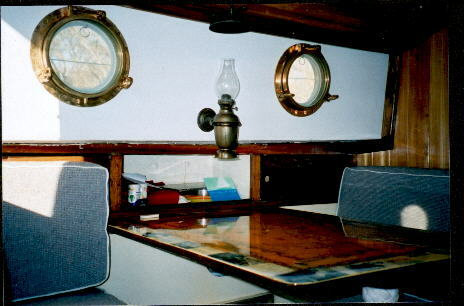 The exterior of the large windows had no frames and there were old plastic vents thru the topsides everywhere., even the seatbacks in the cockpit had vents in them, making sitting in the cockpit for more than 2 people difficult. The vinyl overhead looked like a tent, there was no head or holding tank, the wiring setup needed to be straightened up and replacing. 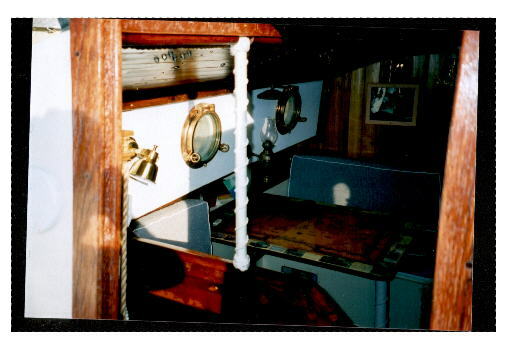 We decided to strip plank the sides of the v-berth, quarter berths and overhead as well as 1/4 inch carsiding for the bulkheads, and since we decided to paint the hull black, two layers of 1/4 inch insulation was installed to the hull and overhead. The windows and 4 vents were fiberglassed shut, the windows being replaced by 8 inch bronze opening portlights. 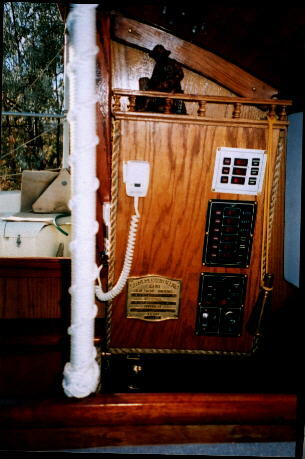 The main hatch was cut out an additional 2 feet forward and framed in and covered with a storm hood for the sliding hatch to slide into and all rough edges were covered by manilla rope.